Sparkling water brand Perrier has opened a pop-up in New York's Soho district, centred around engaging all five senses. The 'Perrier Flavor Studios' launched on 12 July and will welcome guests until 16 July. Aiming to provide visitors with a multi-sensory experience, the event is taking place in a studio located in New York City and features live music, an interactive art wall, ball pit and a 'mocktail' bar. 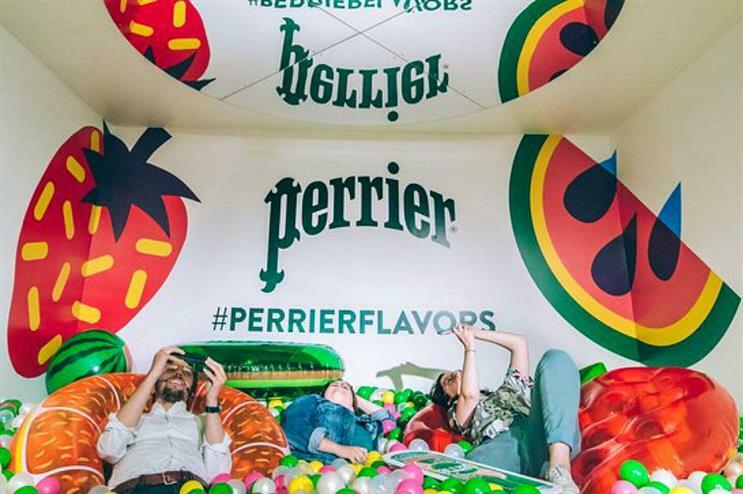 Perrier worked with experiential marketing agency Kinetic to develop the activation, which has been designed to celebrate the new Perrier flavour range. New flavours include Perrier Strawberry and Perrier Watermelon, and guests will be able to sample the brand's latest products. Guests are encouraged to use the pop-up as a means of finding their flavour inspiration and can enjoy the different experiential elements to engage all five senses. Perrier has partnered with artist AKACorleone to bring a digital colouring book to the event, which offers visitors the opportunity to print their colouring work directly onto a tote bag. In June, Perrier celebrated its UK relaunch by staging a picnic party in east London. More: Häagen-Dazs opened a multi-sensory pop-up in May, with the aim of finding the world's best ice cream photographer.